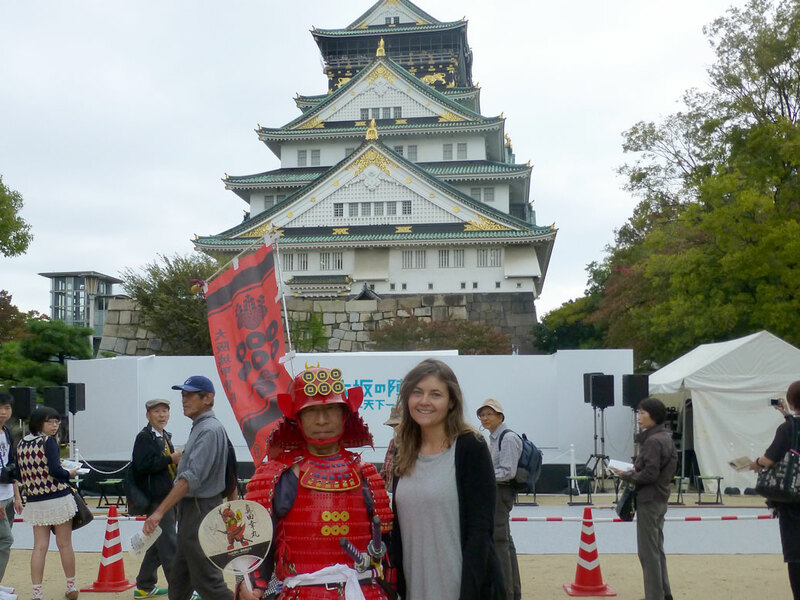 Day two of our Osaka adventure was consumed by the majestic Osaka Castle (大阪城). 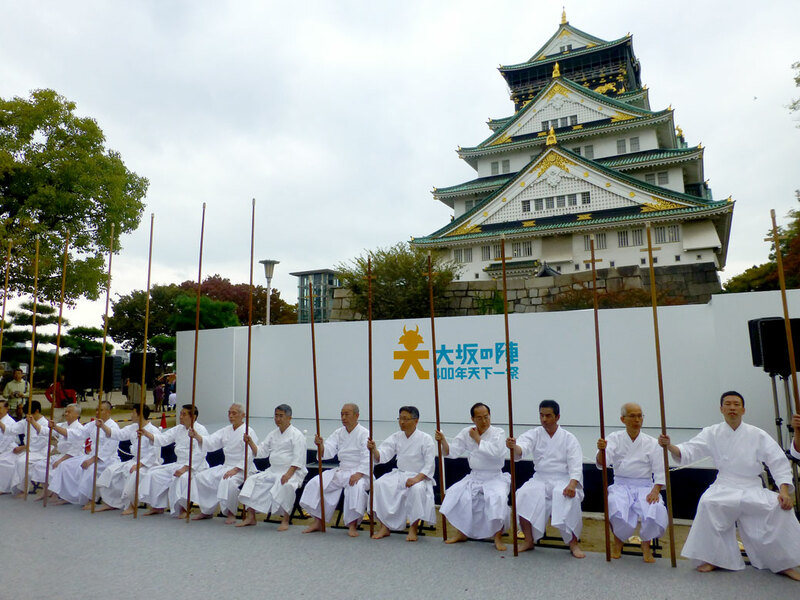 We were lucky enough to visit on the weekend the castle honored the 400th anniversary of the Siege of Osaka, filling the park with several bonus events. Osaka Castle Park was just a short walk from our apartment, located in the middle of the government-building-heavy Chuo Ward. 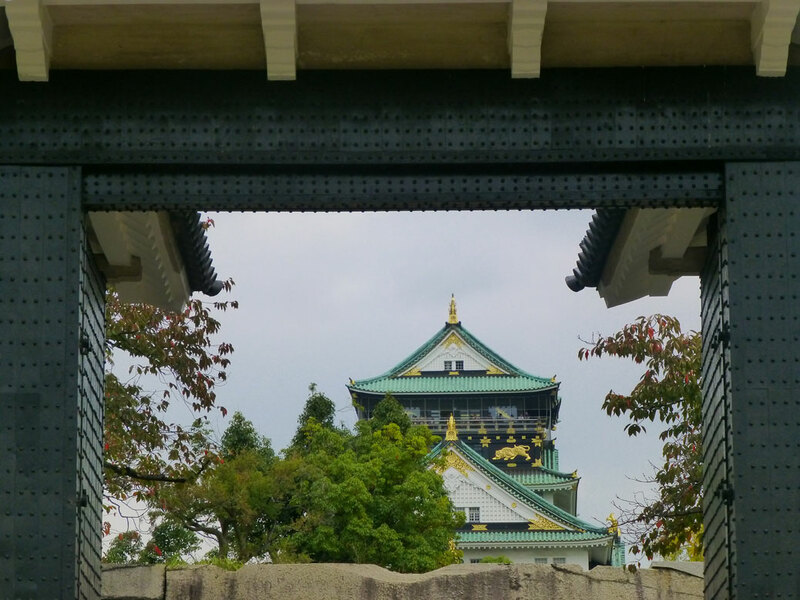 The surrounding area is typical modern Japan, but the park is a sprawling green compound—nearly half a millennium of history in the heart of today’s Osaka. 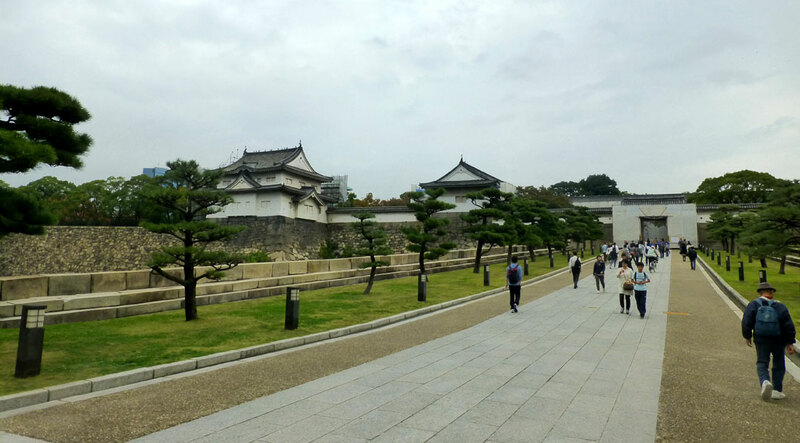 We entered through Otemon Gate on the west side of the complex, Sengan-yagura and Tamon-yagura turrets looming as a reminder of the area’s more violent shogunate past. Upon entering the compound, you get a sense of what life may have been like in those days gone by. 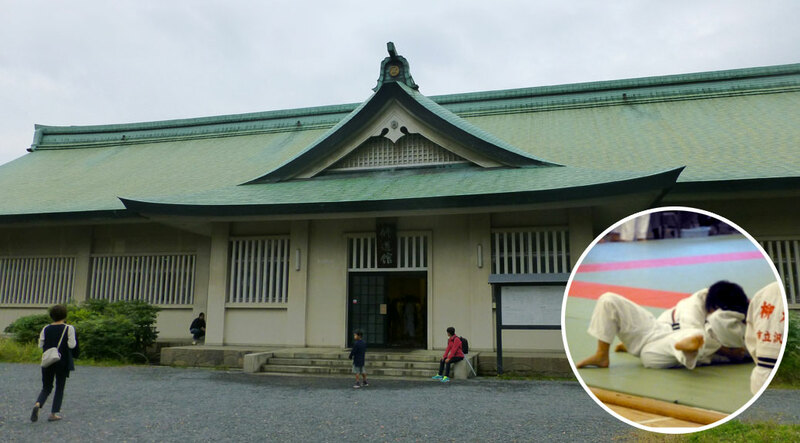 Even today, the Shudokan (martial arts training hall) is brimming with life, hosting judo, kendo and naginata classes. 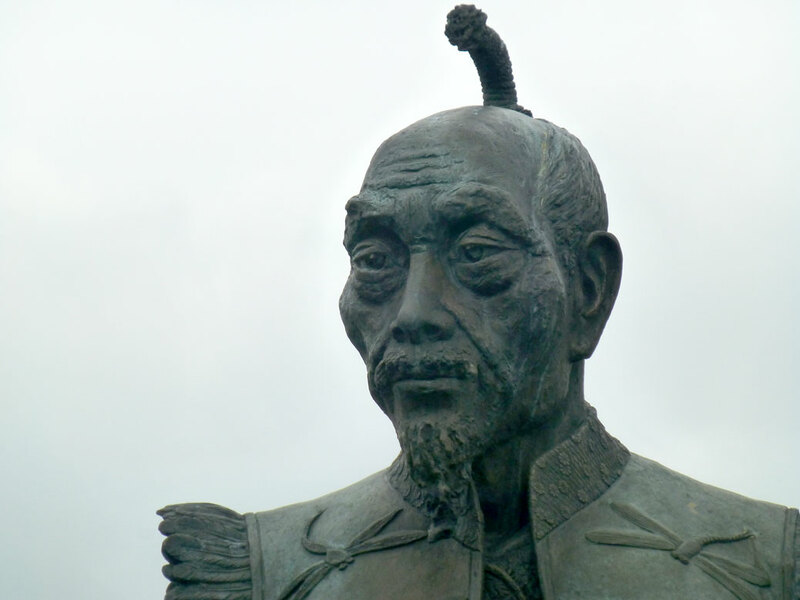 Nearby, a large statue honors Toyotomi Hideyoshi, the mastermind of the castle’s construction and Japan’s second “great unifier” responsible for ending a century of war in Japan’s feudal period. Not long after, we had our first glimpse at the architectural masterpiece itself. Sakuramon Gate frames the castle and marks the entrance to the main part of the castle grounds. The grounds were lively with the festival remembering the 1614-15 Siege of Osaka, which resulted in the destruction of the original castle. Modern interpretations of traditional music filled the air. People in period costume wandered the park, snapping pictures with willing tourists. A Hōzōin-ryū demonstration (see video below) captivated the crowd. Hōzōin-ryū is a form of martial arts that specializes in sōjutsu or spear-fighting. The men wielded the yari (spear) with the respect demanded by history, showing off the different maneuvers like a choreographed dance. We took a break from the castle to find lunch. 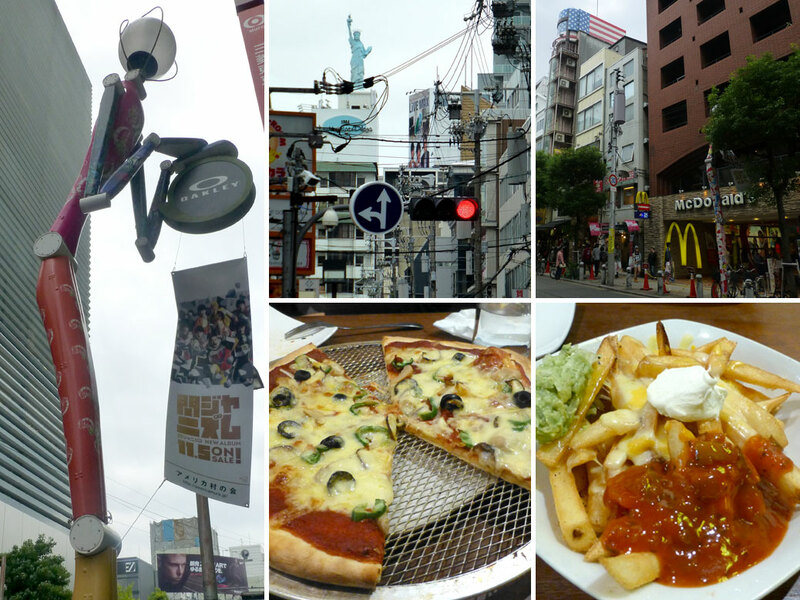 We headed back for the entertainment side of town and landed in Amerikamura. Known by the locals as “Ame-mura,” the area of American Village is Osaka’s take on western culture. While it has a reputation as a foreigner hangout, there aren’t actually many foreigners in the area. It felt very similar to Tokyo’s Harajuku district as far as the types of shops and fashion, but decorated with a tired caricature of the good ol’ USA. We tracked down a Canadian-owned pizza joint called Slices and had a veggie pizza, some tasty fried potato strings and a nacho-style poutine. Refueled, we headed back to Osaka Castle for the rest of the festivities. We re-entered the park from the southeast side, which leads into Forest Park and the Plum Grove. A climb up a Fuji-steep set of stairs led back into the main part of the park. The sun was beginning to break through the clouds, casting a yellow glow on the city and the castle. The park closes around sunset, bringing an end to our time at both the castle and Osaka in general. The next morning we’d be on the express train to Kyoto. Wow, you really got a dose of history and culture in that trip! I commented to Todd that if the barbarian hordes get as far as the castle walls, it is pretty over anyways! I guess the mote and all was more symbolic than anything, but hey, what do it know? 1. hold and use (a weapon or tool). We’re really enjoying your blog. You asked for questions a few postings ago. Here’s mine: We understand that Japan is very expensive vis-a-vis food. lodgog, etc. Are you finding it so? Good question! I’ll put it on the list of things to tackle. What an interesting trip, Robert, and a beautiful building. I didn’t know poutine came in nacho-style! Talk about an ethnic mash-up! Mexican-style Canadian food in Japan’s America Village. I think I filled up my passport with that meal!